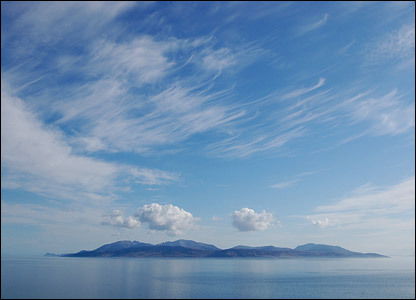 Clouds over Arran by Gordon Baird, from the BBC Scotland website. Off to Islay tomorrow. In case you are wondering, its in the Inner Hebrides, and its pronounced 'EYE-lah' The latest weather forecast for the area was for 50-60 mph winds, driving rain and max temps of 12 degrees. It is forecast to be 22 degrees in Norfolk tomorrow. Ever wonder what the hell you are doing??? I am hoping to get some painting done, and may even be able to post while we are away - but don't count on it. If not, have a groovy week everybody, and I will tell you all about it when I get back.